Lots of people think cavities are a normal part of growing up. Growing Great Grins is here to prove otherwise! 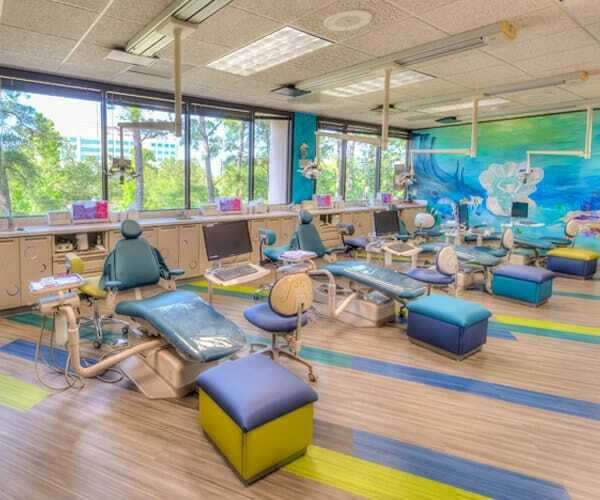 Our general and preventive dentistry caters to little teeth from tots to teens, offering dentistry that not only treats teeth but also prevents problems before they really get started. We believe that all dentition is best in its natural state and do whatever we can to keep it that way. Drill and fill are just not us! Instead, we focus on things like super-extensive exams, ultra-effective cleanings, fluoride protection, and sealants. We also recommend that you start bringing your child to see us when the first tooth erupts – or sooner! We do see infants and can evaluate the health of their frenulums and other soft tissue to prevent nursing problems as well as speech and other issues. But even if baby doesn’t see us until her first year, visits to Growing Great Grins are so relaxed and so much fun, kids beg their parents to come more often – we are just that different. We are out to revolutionize the way children experience dental care! To Grow Great Grins, start taking care of them early. You can start cleaning baby’s gums with a soft cloth before any teeth even appear! This helps your wee one get used to the feeling of oral cleanings and reduces anxiety at the dental office. It’s also great to let siblings brush, floss, and visit the dentist together. Make the morning and evening ritual a special event with a brushing song or fun video to help keep track of the time. You can even join in the fun – after all, tots love to imitate their parents! But home smile care involves more than just proper brushing and flossing. It also involves what your child eats and drinks, as well as when and how often they do it. The more time your child spends snacking and sipping on carb-rich and sugary treats, the more time those precious teeth will be exposed to cavity bug attack! Don’t let your child have juice, soda, or sports drinks in a bottle. In fact, these drinks are best avoided. Real fruit juice is ok at mealtimes, but be sure to brush after! Never let your little one carry their bottle or sippy cup. Especially don’t let them fall asleep with it unless it contains only pure, fresh water. Avoid sticky snacks – even healthy ones like raisins or dried fruits can get stuck in teeth and feed those cavity bugs! If your child really needs to snack between meals, try offering tooth-friendly snacks like crunchy veggies, cheese, or nuts and be sure to encourage her to at least rinse with water after eating. Stay far away from sour candies! The acids in them can be as damaging to teeth as battery acid! There really is more to great pediatric oral health than we can possibly tell you about here. Next time you are with us, tell us you’d like to hear more! We can give you all kinds of tips and tricks for home hygiene, tooth protection, and nifty nutrition for even the newest smiles. Comprehensive exams let us do much more than count teeth and look for decay. Instead, we check for things like cavity “seeds” that can be treated without drilling, gum inflammation that could indicate improper brushing or periodontal issues, proper eruption patterns, proper jaw growth and alignment, and the impact of habits such as thumb or pacifier sucking. Of course, we also check the oral soft tissues for pathology, infection, or sores, as well as doing a lymph node check. Our findings are always compared to previous checkups, quickly and accurately, with our computerized system. We can even show you how your child is doing from visit to visit! When needed, we include digital x-rays to take a look at what is happening under the enamel and gums. Comprehensive exam visits and checkups also include time to talk to you and your kiddo. This is an important part of your exam and we never rush you through it. You are just as big a part of your child’s dental health team as we are! We are specially trained to recognize even the subtlest signs or symptoms of mouth cancer so it can be caught and treated early when it is most reversible. X-rays may have been around for a long time, but we still find them fascinating – and so do kids! Our digital x-ray technology makes it easier and better to screen for problems and to use the photos as an educational tool. Why? First, digital x-rays expose your child to much less radiation than traditional x-rays and are easier on the environment too! Second, these x-rays are visually clearer and crisper and can be saved directly to our in-room computers for immediate viewing. That means you and your youngsters can take a look at what is going on inside the teeth and all the way into the roots right along with Dr. Leslie or Dr. Judith. Plus, because they are stored on the computer, we can easily pull them up for comparison visit to visit! Growing Great Grins also has panoramic x-ray technology so we can get an overview of any child’s head, neck, oral cavity, and jaw. Panoramic x-rays can be great for special-needs kids, little ones who have trouble sitting still, experience anxiety, or have a strong gag reflex because they don’t require any film or device to be placed in the mouth. Instead, the panographic digital x-rays stay outside of your child’s mouth and move around his or her head. Because the image produced is of the entire head, mouth, and jaw, it lets us check the position of wisdom teeth, evaluate the need for restorative dentistry, look for things like infection and abscess, and even check your kiddos’ sinuses. We know you do a great job of brushing at home. You got the Frozen toothbrush, the My Little Pony toothpaste, and floss, and the Elmo tooth brushing video. You even double-check your toddler’s teeth when she has finished and do it for her once in a while just to be sure. Yeah – your home hygiene game is strong! Our ultrasonic scaler gets teeth the shiniest, smoothest, most awesome-feeling clean faster and more comfortably than any other hygiene tools. We also have the Prophy Jet that blasts out a salt-water solution to clean around braces, brackets, and restorations. It’s like a visit to the waterpark…but in miniature…in your mouth. Well, sort of. Kids seem to like it! And they really like how clean and fresh their teeth feel! You had it when you were little. Sometimes it’s in city water, but it is usually never in well water. It is in toothpastes and mouth rinses. It’s fluoride – but what is it and what does it really do? Fluoride is a naturally-occurring mineral compound most famous for its ability to fight – and even reverse – tooth decay. But it isn’t just a superhero disrupter of cavity-bug activity. It is also a great protector in other ways. Fluoride can help rebuild and strengthen teeth! That’s important because right from the beginning, teeth are under attack. Tiny teeth are exposed to milk. Teen teeth might suffer from sports-drink-itis. In fact, even daily wear and tear like chewing on fingernails, biting a pencil, or chomping on ice all contributes to mineral loss on those pearly whites. Sure, saliva naturally helps remineralize, but adding fluoride treatments really does ensure that teeth are as hard and strong as they need to be. Make sure the toothpaste you buy contains it (yes, even that sparkly stuff has it! ), but monitor how much gets put on the brush (a pea-sized dot it all you need) and make sure everyone spits after brushing. Fluoride may be good on the surface, but swallowing too much can cause white spots on teeth! We also recommend that you talk to us about regular fluoride treatments. We offer fluoride treatments at every visit and have a variety of flavors for youngsters to choose from. Kids love it! In addition to regular fluoride treatments, we also have Silver Diamine Fluoride available for special needs patients, babies, and children whose teeth will be falling out soon. SDF can be painted directly on caries lesions to stop active dental disease and cavities in its tracks without any invasive treatments. This is not our first choice for cavity care, because it does stain the teeth it touches black, but in instances in which children are unable to sit with their mouths open or tolerate any drilling, this is an effective, FDA approved alternative. It’s definitely a tooth-saver for some of our patients! We rarely have to use anesthesia, but when we do, you can rely on the fact that your child will be absolutely relaxed and comfortable for any procedure. Read more here! Everyone wants a straight, beautiful, comfortable smile – and some people are willing to wear braces to get it. Other people need braces for more than the way their teeth look, they need braces so they don’t get headaches or so their jaw opens and closes correctly. 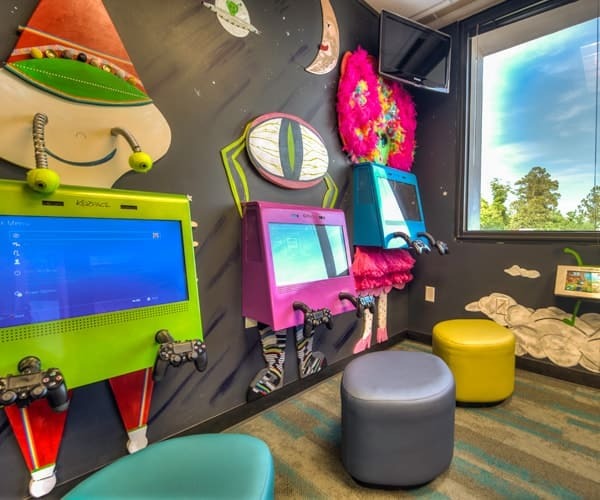 No matter why your little people may need orthodontic care, guess what: Growing Great Grins shares their waiting area with an awesome orthodontist! That’s right! If we discover that your youngster would benefit from braces or other orthodontic treatment, we will refer you right over to our friend next-door. 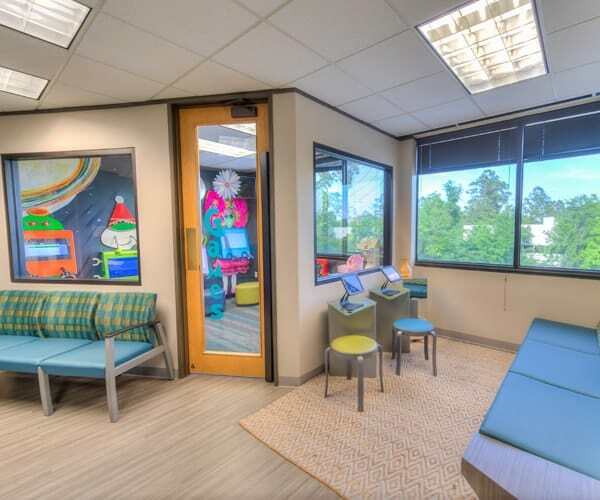 Sometimes, we agree that it can be better for some little ones to continue care with us, in the office they trust and are familiar with, so on occasion, Dr. Leslie will treat kids with palate expanders or space maintainers while they get to know the orthodontist. 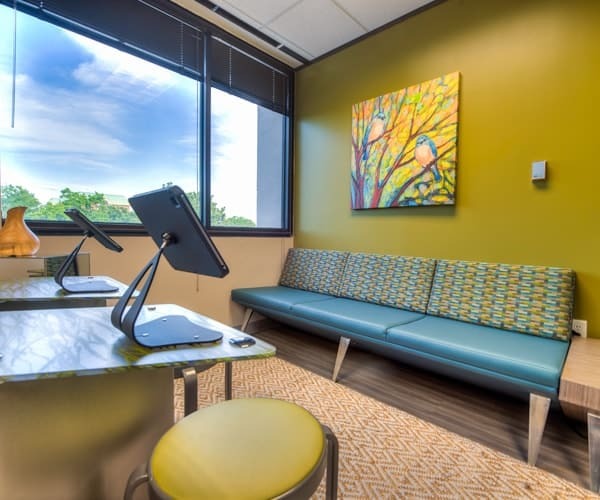 In most cases, though, whether your child needs a little tooth straightening, gaps closed, or other orthodontic treatment, our friend and neighbor here at 1001 Medical Plaza Drive can help. We think he is the best…but if you have another orthodontist you’d rather work with, talk to us about that as well. TMJ disorder is terrible. It can cause anything from loud snaps, crackles, and pops when you chew (and it most certainly isn’t your cereal making all that noise!) to chronic migraines. No one wants that for their darlings! The trouble is, even kids can have problems with their jaw or their teeth and develop pain and discomfort that may be originating in a TMJ issue. Does your child, teen, or special-needs patient suffer from any of these symptoms? Then please call us right away. We can take a look at your child’s head, neck, and jaw using our panoramic x-ray, or refer you directly to the TMJ pain clinic on the second floor of our building or to a trusted myofunctional therapist named Sue Merino – or both! Do not let your child continue to suffer from TMJ disorder. Get them on the path to feeling better fast. Growing Great Grins is here to help! Emergencies come in all shapes and sizes – sometimes your emergency might just involve the need for ice-cream. Another time it might have to do with something less soft and comforting – like a collision between the floor and a little mouth. Or a sudden, stabbing pain in a molar. The ice-cream emergency can be taken care of down the street at Marble Slab Creamery, but the second or other tooth-related emergencies? Call the team at Growing Great Grins! We are always available to help when a dental emergency happens. If the emergency is related to an accident or head trauma, call us, but also head to the emergency room. It is important that we monitor any mouth injury, even if you are treated at the hospital. If it seems as if we can treat the problem here, we will work you right into the schedule. If your accident occurs on the weekend or after hours, don’t worry, we can help with that too. We are in a call group to make sure our patients always have access to a dentist. In addition, the Growing Great Grins team is completely prepared to take care of emergencies both in and out of office visits and sedation procedures. Dr. Leslie and Dr. Judith attend pediatric dental simulation courses to gain practice in managing emergencies, and we run quarterly drills to refresh our skills so that the entire team is ready to spring into action when an emergency arises.